GETTING THE TRICKY BIT RIGHT! If there’s one thing that all print on demand artists find difficult, it is the part of the preparation to sell your masterpiece that involves writing metadata tags, and writing a description. I have no doubt in my mind that artists who sell through more traditional methods find the task a challenge too. Imagine completing a work that you have spent hours creating, and then finding that you still need to spend at least another few hours working out exactly which metadata tags will help your work climb higher in the search results, and then you have to write a description. I don’t know about you, but sometimes I have held off from offering a piece as soon as it is completed because I suddenly develop brain freeze. Ask me to describe someone else’s work and I can verbally tell you in less than 500 words what that particular artwork says, and I can give you way more than 500-characters of metadata. I carry out this task for myself, I become completely blank. Some artists enlist art brokers to do that kind of thing, but for those of us who are unrepresented, it is a task that requires some thought, and those thoughts eat away in to time we could be spending creatively, or at least drinking coffee. Metadata is critical to get right if you want your work to show up in search results. Imagine it as a series of words that describe the art to then file away in one tiny drawer in a very large room full of drawers. If you don’t have a way to search for it, how will you find it in the future when someone else has maybe moved it in to another drawer, or a million new files have been squeezed in to the same drawer? 1. a set of data that describes and gives information about other data. There are millions of pieces of art available on print on demand sites such as Society 6, Fine Art America, Zazzle, and the rest of them, you need a way to be found otherwise you’ll just be consigned to that drawer forever. There are of course other factors that will help to get you noticed, or more importantly your art, a good description of the art is essential. This week I took a look at a couple of print on demand art sites, I also took a look at a print on demand site that only publishes books, and I just couldn’t believe what some people were actually writing when they are describing their work. I admit, the description (and the metadata) are the two things that I most dislike about the whole process, apart from completing a tax return which is possibly one of the worst things ever that an artist has to do at some point in his or her career. The descriptions I read, I thought about listing in this blog post as a guide to how not to do it, but as an artist myself, I thought that naming and shaming wouldn’t be the greatest idea, us artists need to support each other, but I also hoped that no one would come back after reading some of mine. However, to give you an idea of what I am talking about, here is one that I read from an artist who I know very well. An artist who just like me struggles, and an artist who I spoke to last week who said, please use this description as an example because I am embarrassed I even wrote it. (Word of note, a week has passed and he still hasn’t updated it). The artist in question had spent more than 30-hours on this piece of work. Essentially it is a painting that was produced using acrylics, pallet knives, a small flat brush, and depicts Times Square New York at night, in the rain. Acrylic, 36x24 inch on canvas. That’s all there was. Yes, good to know the size of the original, good to know it was on canvas, but nothing that told me what it was. If I had never seen a photograph or visited Times Square I could have thought it was Kathmandu, a place I have never visited. There was nothing to describe in what year it had been painted, (1998 is the answer), and nothing that indicated that this was the original painting, and was actually unavailable as a print. Nothing to describe that in fact it was a limited edition 1 of 1, and nothing about the artist. There was also a lack of metadata, when I say a lack, I mean there was no metadata at all. Nada, nope, nothing. In three years it had been viewed a total of four times, three were probably bots indexing for search engines, where it also didn’t show up in any search results. One other thing, the title was also a little off, he had called it untitled. Even the word null in every text field would have provided a better result. The only other information was a contact address for the artist, and the price. $2000. Unless you knew the exact web address you would never find it. When you sell your art, perhaps one of the most critical things you need to do is to provide information. We are a global population that reads every label on every product, so why leave the label off an item that is as expensive as some artworks? 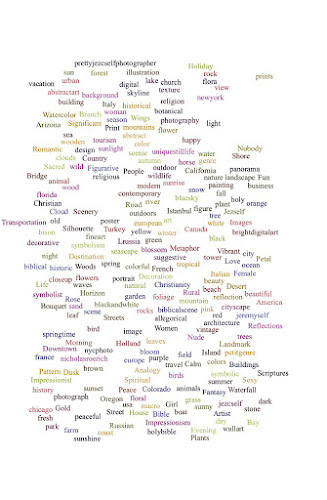 The question is just how do you create a description that inspires the buyer to buy? I have read so many artist descriptions over the years, and it’s something that I still don’t get right 100% of the time. Artists are generally artists not writers, and very rarely are they PR gurus. The best artwork descriptions should be looked at as being the salesman. If I could meet the customer, what is it that I would say to make them want to buy my art? There is no magical sentence or paragraph that can be used, but every artist needs to make a connection with the buyer. Be that face to face, over the phone, in an email, in your artists description, one thing is certain that many art buyers like to engage. There are no hard and fast rules to writing a good artist description for a piece of artwork. My friend has upped his game with new works, I am desperately trying to do the same, but there is a certain amount of detail required. Often I am tempted to just say, created by an original starving artist, please just buy it, and tell friends and family to do the same. I tend to place everything I need to write in to two categories. Inspiration, which needs to engage and invite the customer, and it should also reflect you and your personality. There is some debate on whether this should be written in the first or third person, in general though, I have had equal success and failure with both. To be honest it all seems like smoke and mirrors and you may want to alternate depending on your audience. Using third-person can come across in a way that feels like an impartial and independent endorsement, whereas in the first person it can be much more personal and engaging. One caveat that needs to be considered carefully is when writing an artist’s biography, for the most part third-person works much better for this. Whatever it is, however it is written, it will need you to get across your passion for the work, and be representative of your personality. Useful things to add might be, what was your inspiration to create the piece, and if there is a story behind the work, all the better. You might also want to add a little around the techniques used to create the piece, what the piece means to you, and what it represents in terms of your overall artistic work. When print on demand sites feature artwork, it is also good to have a useful description of the art in place already. Many of the sites will be looking at the descriptions as part of their selection process, it then makes it easier for them to write a feature. Then there is a second element. This is often the bit we do manage to get right. What materials were used, the medium such as pastels, digital, oil, watercolour, and obviously the dimensions are important. It is also necessary to do some math at this point. When listing dimensions you need to cover centimetres and inches, maybe even millimetres. When I buy artwork online I always look at the dimensions, but if I buy from a gallery, I must admit I tend to just think, that’s nice, I think it will fit. It is also useful to indicate how the item will be shipped. How will it be packaged, do you offer to ship artworks both rolled and stretched, and point out that many POD sites now offer local and regional shipping to avoid surprise customs costs. If you are selling on print on demand, generally most POD sites will be offering a 30-day money-back guarantee. Although this will be evident on the POD site itself, it doesn’t hurt to reinforce the message. It is a good selling point when buying online. It is also good to give the buyer a way to contact you via email at least. Encourage a buyer to get in touch, because this is where you get to practice your sales pitch. Whenever this happens to me, I do tend to view each contact as a possible sale for an original multi-million Dollar purchase of an original Matisse, even if it’s just for a greetings card or a T-Shirt. I’m all about the experience. Verbal description is increasingly important in today’s society. We are far more aware of the needs of others in terms of disability and accessibility, and increasingly verbal description is used before, post, and during gallery tours, even to those who do not have disabilities. It is a way to verbalise the key points. It’s a similar concept to a successful PowerPoint presentation, but one that can be talked through. Now let me set one thing straight, I do not recommend that every artist description is written in PowerPoint, and it should never ever be written in comic sans font. But it should follow the principle of tell them what you will be telling them, tell them what you want to tell them, and tell them what you have just told them. Verbal description should include standard information, the artists name, the title of the work, key dates, mediums, dimensions, nationality of the artist, giving the viewer/buyer, quick, relevant, facts that they can easily recall. Whilst we are on the subject of verbal description, it is also important to remember that a general overview of subject, form, and colour are also essential. A general overview of the work that clearly explains a work piece by piece, followed by what is represented in the work, and then include the colours and tones, even mood and atmosphere. If this is coherent a viewer can assemble the entire piece in their mind. They are much more likely to remember this. Also it is really important to remember that there are actually art buyers and collectors who are visually impaired. One of my clients has only partial sight, but she is able to describe the piece to anyone, and she has a picture in her mind of what the art and the subject actually are. When I describe old masters, she can recall with striking detail the colours and detail in each painting. The reason for this is that she has a memory of colour recalled from days when she had full sight, now she has lost some sight, it has never stopped her enjoying art. Whenever this lady buys my work I always ensure that specific information is given to her, referring to the positions of numbers on a clock, I am able to point out that at 6 o’clock there is a white sandy beach with darker tones where the tide has broken on the shore. At 11 o’clock, bright white rays of sunshine beat down to 5 o’clock, washing the beach with sunlight. Adding in some historical concept of where the landscape is geographically also helps to build the bigger picture. Whilst this level of detail is not necessarily important in a 500-word description on a print on demand site, it does allow the artist to study the painting from a different perspective, helping to prompt ideas for a more general description. Describing the importance of the technique used is also something that I am guilty of not doing. For me, 99% of my work is digital. The 1% of work I do on board and canvas needs more explanation. Oil paint is suspended in a viscous oil medium that is slow to dry. It is easily manipulated by the brush, and allows the artist to blend colours easily. This makes it easier to form the paint in to layers of thickness that give the work depth. By doing this you can use the technique to produce light and shadows. Explaining the style of the work is also important, here we refer to the features that identify a work as being produced by a particular artist, movement, school, or period, and even geographical region. If everything else is covered you will be able to focus on how the many elements of the artwork contribute as a whole. From here on you can focus on the vivid details of the work, focussing on different parts of the artwork enables you to help the buyer build up an image that is easy for them to picture and remember. This also helps you as the artist to look at the work from another perspective and by doing this, it really does help when creating the description, it opens the mind. You do need to be very clear when describing art. You also need to remember that not everyone has a compelling understanding of language, particularly where English or whatever language the description is written in is not the viewers/buyers first language. You must be careful to avoid ambiguous and figurative language, and you need to avoid making assumptions about the viewer’s knowledge of the process involved in creating art, and art terms and pictorial conventions such as perspective, focal point, picture plane, foreground, and background should always be defined for your viewer. Of course if you follow all of the above, firstly you will be spending as long writing the description as it took to paint the work, and secondly, some online art sites and services limit the amount of text that you are able to type. But one thing is certain, by following the basic principles outlined above, and making sure to utilise the spell checker, eventually art descriptions will become second nature. SO WHY IS METADATA SO IMPORTANT? If you have ever worked in information technology for more than a couple of years you will know that the entire concept of metadata is nothing new. In fact, we owe the honour of introducing metadata to librarians around the world. The term emerged in the 1960’s and has been used since the dawn of the Dewey Decimal system used in libraries for classifying and categorising books so that they can be easily located on shelves. A point I put to the test recently at the local library, when I asked the librarian where to find a particular art book, she immediately responded aisle three, fourth bookcase along, third shelf from the bottom and it will be next to a much larger book called The Art of Disney (I already own that one, it is phenomenal), and it will be to the left. At this point I wasn’t sure if she was a librarian or Rain Man. She certainly knew her stuff. As I walked away, she called me and said to put it back in the exact same spot when I had finished it. Libraries present metadata in a physical form, but in our virtual world the principles remain the same. To quickly navigate across huge data repositories and efficiently find, manage, and track information. Metadata controls what would otherwise be chaos, and it is used for everything. There are of course other uses for metadata, not only can it be used for searching for and finding pretty much anything, for me, it is a tool that can be used to see at a glance, a real time update as to what other people are searching for. No point in me spending 20-hours creating a piece of art knowing that actually no one is interested in a portrait of a donkey knitting a woolly hat. Maybe they are, but they’re not showing up in any search results I have seen. I generally use a number of tools to keep me informed of current search trends, it really is useful when you are a blogger or an artist to keep ahead of the game. Using some of the Google search tools also allows you to view historic trends, of course future trends are more difficult to ascertain, but by understanding key words, metadata, and search terms in general, you can start to at least predict in the short term. By using https://www.google.com/trends/ you can see what has recently been searched for, and you can even break it down in to categories. The history of search is somewhat telling, and compelling viewing when trying to figure out what’s hot and what’s not. You really don’t have to be a professional data analyst anymore to do this, there are so many simple tools that can be freely explored on the web, and indeed, Saatchi, and Fine Art America display their most searched for keywords making the job so much easier. Rather handily, I have produced the two following graphics that show the search terms from April 2016. The entirety of the most searched for terms from both sites are also written below. It might be worth copying these across to your own spreadsheet so that you can quickly utilise them when uploading relevant art, and you'll be able to apply the usual Excel or Numbers on Mac filters to sort them. Remember though that search engines will penalise you if you incorrectly use metadata tags, if they are not relevant, they get picked up as spam and you will drop down the results quicker than a fireman sliding down a greased pole. The data that can be found all across the web relating to specific searches can be used not only to inform on relevant keywords, but also to inform your direction of travel in terms of creating art that has a higher chance of being found, and a higher chance of selling. There is no guarantee, but if your work is liked and appears higher in the search results, it has a better chance of converting in to a sale. It is a theory I have used previously, I created a piece purely based on search engine results, in part because I do like to dabble with little experiments, and in part because I was inspired by the subjects that were returned on the results pages. The upshot was that within a few days of uploading the art, the piece actually sold. Not that one piece in a ropey experiment proves everything, but interestingly it continues to sell. There are two ways in which I use data other than to provide keywords, firstly I use the data to support any given subject that I am creating as a piece of art. 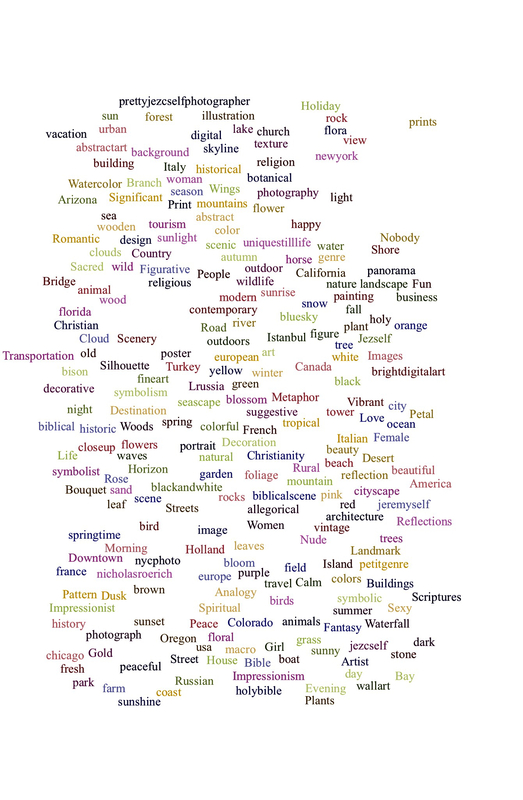 If I create a landscape that features a boat and a beach, I search for keywords using Google’s trends, and this gives me a useful idea of how popular the work is likely to be. I then use https://adwords.google.co.uk/KeywordPlanner to search for useful keywords. There are other keyword generators available, and you will need to have an AdWords account with Google (free), to utilise theirs. Another keyword generator I often use is http://lsigraph.com/ Its simple format allows you to enter a search description in the text box and it generates a list of relevant suggestions. You can use limited features without having to sign up to anything, but one tip I will give you is to make sure you are using data from a range of at least two or three tools. The more the merrier. Once you have the list, you can jot down the important keywords, I tend to do this in an Excel spreadsheet and have pages relating to categories. Then when I produce the next and subsequent works I can come back to the spreadsheet and simply copy and paste. I tend to update the spreadsheet every couple of months, I would do it much more frequently if I had the time, and / or if I focused only on one subject. Secondly I use the trends data to inform me about what people are actually searching for. This is really useful when you hit a creative block. For the most part my art is planned and I maintain a checklist of subjects I want to cover. The downside is that I might be really feeling the love for a particular subject when I write the list but if a psychologist took a look in my head they would find chaos of the first order. My consistent love is for abstracts, but then I decide that this week I’m feeling the need to paint Polar Bears. You could say that I haven’t found a true niche in my 46-years of wandering around this planet, I say that I like to explore and that’s my niche. When I stumble across a relevant search term and it appeals to me to create a painting of that particular subject, then I go ahead and paint it. There seems to be a train of thought that all artists should be consistent in terms of subject and style, but I think if the quality is consistent, that should really be the main focus regardless of the medium, style, or subject. Yes, I do like to experiment, and I’m not too sure I will change anytime soon. But for those artists who like so many of us have to create artwork with the most on point relevance to the market in order to pay the bills, using keyword and metadata can help enormously to predict what might have a chance of selling. I have read on the internet that some people relate this to an artist selling out, but the reality is that sometimes you have to produce something different that people will buy to enable you to eat. I don’t call it selling out, I prefer the term, surviving. I spoke about the issues surrounding local and independent artists recently in another blog post and contrary to popular belief many artists also have to hold down full-time jobs to pursue their artistic passion in the few hours of the week that remain. With many print on demand sites pushing art to the masses, some of which have hundreds of thousands of artists all competing and doing the same, you have to wonder just how many will eventually be remembered for that one piece. Going it alone in the art world without a broker, a gallery, and some good luck, is a difficult exercise, particularly when you have no financial support for promoting your work. What will make you stand out, is being on point, giving people what they want, and only once this is achieved will you be able to sell people the work that they didn’t know they wanted. Long-tail keywords are longer and generally more specific phrases that visitors use to find something in a search engine. 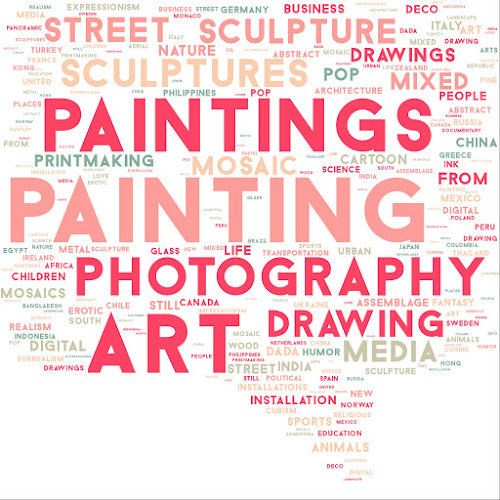 Many websites and services who sell art online allow the artist to create long-tail keywords, usually by including the sentence within “quotes”. But what are they exactly? Well, they’re the three and four keywords that make up a specific phrase, making the search more specific than let’s say just “shoes”, the results for shoes would be far higher, and given that you wanted to actually buy red shoes, something like, “buy red shoes online” would provide a narrower and much more relevant set of results. Remember that people tend to be searching for exactly what it is they are going to buy. If you are an artist who creates abstracts, chances are that you will appear lower in the search results. If you are an artist who creates Mondrian (I always think of Microsoft Excel spreadsheets that have been filled with red, white, blue, and green colours), inspired abstracts, then it is more probable that you will be nearer to the top of an organic search result. Organic meaning that you haven’t paid to be at the top. If you use something like “Mondrian inspired stretched canvas prints” you will creep up further and become more visible to people who are looking for “Mondrian inspired stretched canvas prints”. Sometimes we forget how we ourselves utilise search engines, so when you are figuring out which long-tail keywords you should use, try searching for the exact same style of art you are about to release. How did you do it? Chances are other people would be using the exact same long-tail keywords as you just did. The traffic generated from long-tail keywords will more often than not be much less than if you go with single keywords. But ultimately the traffic you do receive will be better focussed, more committed to making a purchase, and will be more inclined to engage further. Although there is a lot of traffic generated from short-tail keywords in general on the web, the reality is that they make up fewer searches overall, maybe around 15% or so. Mid-length tail searches make up a slightly higher proportion, but overall, around 70% of all searches are long-tail keyword searches. It makes much more sense to include long-tail keywords in your strategy. I cannot begin to think just how much money I spent in the early days on ads. I was definitely using that technical approach to setting the ads up called “wing it”. Honestly I had little hope of getting it right. At the time I couldn’t quite figure out all of those acronyms and terms such as ACE (AdWords Campaign Experiments), CTR (Click through Rate), and contextual targeting. I spent more or less a whole year working out just what each acronym and feature did, and I made many notes. I do tend to write everything down, it is a strategy for helping me to remember what I did a few minutes ago. The inner workings of using AdWords will need to be left for another post. But whether you are optimising your site for search engines, or advertising your art, there is no denying that you need to understand how keywords are used in order to actually make it all work. Many people leave this to professional organisations who eat and sleep SEO and advertising, and for good reason. It is just about as complicated as it can be for the uninitiated. The downside of leaving it to the professionals is that it doesn’t come cheap. If you plan on going down this route you will certainly need to have access to a budget. The only “cheap” way of doing this is to either ask a friend, or do it yourself. If you ask a friend, make sure your relationship is strong. Long-tail keywords are essential for those who wish to rank their content in organic Google searches and for other search engines too, but they are vitally important if you plan to run a paid for marketing campaign. If you don’t have long-tail keywords in a marketing campaign you will come across more than a few pitfalls. With short keywords such as “art”, competition for higher rankings will be fierce, ROI (Return on Investment) will be low, and not everyone searching for art wants to actually buy any art. If this were a physical retail store, we would essentially call these clicks, browsers not buyers. If you utilise long-tail keywords you will see less traffic to your site when looking at site visit stats, but the ROI will be far greater. This is because you will be attracting the right audience, those who know what they want to buy, and when they find it, chances are they will start adding your artwork to the shopping basket. This is because when you bid (something else that confused me for months) on long-tailed keywords the cost per click is lower because fewer other people will be targeting the same keyword string that makes up a long-tail. If you get the long-tail keywords correct, then you will rank much higher in the results and it needn’t cost anywhere near what you would have paid for keywords with a high competition. Getting it correct though is a difficult task. It needs planning, and you need to do some research before committing your credit card number to Google or the other platforms that offer advertising. The secret to success here is that you need to find a sustainable source of long-tail keywords that are right for you and your market. Many keyword suggestion tools available online fail to cover long-tail keywords, they focus on short-tail keywords and ignore the real fruit on the tree. Sometimes it’s not creative block that stops you moving on with a piece of art, its writing that artist statement and selecting the right keywords when you post it online. The art is easy but choosing the right words is often the difference between a piece of work being passed by and a piece of work selling. An artist’s statement is a written description of the work, a brief verbal presentation for and in support of the artist’s work and which gives the viewer a greater understanding. Well that’s what Wikipedia says, but I say that an artist’s statement is actually much more than this. It is an opportunity to represent you when you cannot be face to face with a potential art buyer. Artist statements are also useful for those times when you apply for arts funding or grants, and when entering competitions. When exhibiting your work the statement is necessary because it will provide information to the viewer, and if the work is for sale, it is that information that will help to convince the buyer that they want to own the work. For curators, reviewers, and those who critique your work, the statement is important because it can explain so much and provide a wider context, in press releases it becomes important because this is another opportunity to get the work exposed, but the statement is not the press release, it is only a part of it. There is one other thing too, in that it is especially important when it comes to selling work online. It acts as the descriptor which search engines can decide the pages ranking with, along with other forms of search engine optimisation. I wrote about the importance of great search engine optimisation (SEO) last year and you can read it here. http://www.beechhousemedia.co.uk/2016/04/the-latest-keywords-to-improve-art-sales.html so today I won’t dwell too much on the SEO, except to say that combining today’s post and last year’s post will provide a start towards getting your work seen by search engines. I think at one time or another we have all probably been through what I call statement stress. Usually right at the time when the art is completed and there is a self-inflicted target to get the work uploaded on to an e-commerce platform and start making money. Regular readers will know that one of my biggest pet-hates is when a beautiful piece of art is uploaded on social-media or on an e-commerce site and the descriptor reads “24x30 Oil, Canvas, $300”, which translates to I haven’t really thought about this but just buy it. Artists are the harshest critics of their own work but what really matters is when someone else with an understanding of art critiques the work. Whether that critique is good or bad, we as artists can take something away from it because as artists we should never stop learning. If we learn something about our work that we didn’t pick up on before, all the better. Art is so much more accessible in the modern age. At one time your options for viewing art were either galleries or from books. Today you only have to log in to social-media and your senses will be tingled with literally millions of images right on your own timeline, and of course in the modern age, everyone can express a critique. Most people aren’t art critics, people do know what they like, but how if you are not an art critic do you understand the nuances of each piece, or perhaps it doesn’t really matter as long as you like the art. So a statement, description or whatever you wish to call it needs to reach out to everyone. What the artist statement shouldn’t be about is you. That purpose is served by the artist biography, and neither should it be overly technical, unless you absolutely know your market. Essentially a statement has to be able to hook the viewer, provide a context, and it doesn’t have to be overly long. We have all read artist statements which actually go on for pages and pages and are actually not that different to the statements which read “24x30 Oil, Canvas, $300”, despite the now overuse of words, the statement says very little. My work explores the relationship between Bauhausian sensibilities and urban spaces. With influences as diverse as Machiavelli and John Lennon, new variations are crafted from both explicit and implicit layers. Ever since I was a student I have been fascinated by the traditional understanding of the mind. What starts out as yearning soon becomes manipulated into a dialectic of power, leaving only a sense of nihilism and the prospect of a new beginning. As intermittent phenomena become distorted through boundaried and critical practice, the viewer is left with a hymn to the inaccuracies of our world. This is the kind of artist statement which would be handy on a first date at an art gallery. It sounds great and I am sure it would impress your new love (unless they really know about art), but it has very little in the way of substance. Equally you should never use the artist statement to provide an instruction on how the viewer should interpret your art. Often art buyers and art lovers will find their own meanings to any given piece, what you should do is only offer a guiding lead rather than an out and out forced interpretation. · Finally remember to look at a statement in the way one would when delivering a speech – Tell them what you will tell them, tell them, and then tell them what you just told them. · Remember that the statement is not a press release, although it can be used within a press release. There are a myriad of ways to write a statement. Sometimes it can be six or seven lines, sometimes it can be six or seven paragraphs, and occasionally you might need even more. When you need a longer artist statement this is the time when you are able to describe the processes behind creating the work. There are various styles of writing and again it depends on your target audience. You could use an emotional or theoretical tone, or your tone may be political or humorous depending on the subject matter. One thing I have found out more so over the past few years is that the statements do much better when written in the first rather than third-person and this is why I will be revisiting some of the statements from my earlier works. Before you write anything though it is essential that you are aware of how art is observed, and in art theory books such as John Berger’s ‘About Looking’, he explores our role as observers to reveal new layers of meaning in what we see. How do the animals we look at in zoos remind us of a relationship between man and beast all but lost in the present day? Understanding your art before you write the artist statement is vital if you want to create something that will offer insight into your thinking and provide a context. Understanding the terminology will help tremendously too. So let’s firstly take a look at the art of analysing our work. Analysing art means studying the elements which make up an artwork, and doing this will also give you a little more understanding of the process the artist used when creating the piece. First off we should probably introduce you to some of the basic concepts before we move on to a few words which you might not use in your everyday vocabulary, but which will help you to be more descriptive when it comes to critiquing or understanding a particular piece of art. Imagine art as a series of atoms with each atom making up the artwork. Sometimes the atoms combine and introduce other atoms to make more complex things, in short, art in its purest sense is a series of building blocks with which an artwork is created, and so before we learn to understand a little more about art, understanding those building blocks will provide a more solid foundation. So what are the atoms or building blocks? Essentially art can be broken down into multiple principles and elements. Line, shape, form, balance, space, texture, value, and colour but we also need to consider, variety, rhythm, harmony, emphasis, and movement. Although some of the first elements can be combined to create the latter elements. Artists will use each of those building blocks and will mix them together to create something different. What elements are mixed or not mixed together dictate how the finished piece will look. Knowing what those building blocks are helps us to analyse each piece of art and form an understanding of not just the art, but its composition, and they also help us to convey our thoughts using a common language. Shape and Form: Shape and form look at the formal elements of the artwork. Shapes have two dimensions which are height and width, and are usually but not always defined by lines and we will move on to lines in a little while. Form on the other hand exists in three dimensions, height, width and depth meaning that the representation can be seen from more than one side. We can also have geometric shapes and forms which could include shapes such as circles, rectangles, spheres, cones, and squares amongst many others. Geometric forms are usually man made but not always. Then we have organic shapes and forms which are typically irregular or asymmetrical. Organic forms are usually found in nature but organic shapes can also be created which imitate organic forms by the artist. Patterns are also used to create uniform repetition of any of the elements within a piece of art and almost anything can be turned into a pattern through repetition. Zentangle’s are perhaps one of the best examples of repetitive patterns and are used in combination with lines. 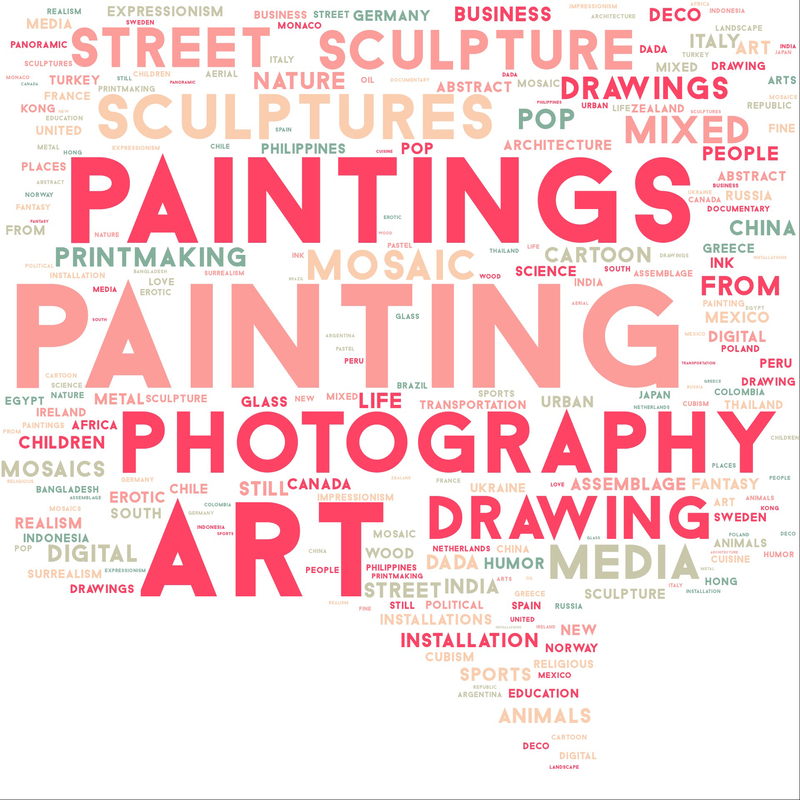 · What medium the artwork is on – is it a canvas, paper, a sculpture, mixed-media? · Colour of the artwork – how has the artist used or indeed not used colour and why do you think the artist used particular colours? · How the colour is organised, are there any repetitions, are certain colours used for highlighting perhaps areas of shade and light? · What is the surface of the art like? Is it smooth or textured, and how does the texture alter or add to the completed work? · Has the artist introduced textures to an artwork? Think about the medium and if textures other than found on the canvas for example are included. · How big is the work? Is it small for a specific reason or is it a large piece of artwork? · Think about the techniques the artist has used to convey details and textures, did the artist show any specific markings within the artwork for example? Sometimes an artist will intentionally paint something specific into many of their works a little like a signature, or they will have a specific technique throughout their works. Check out Peter Max - http://www.petermax.com/ and take a look at his works and you will find that there is a consistency in the way Peter has created each piece. Whether it is his distinctive signature, vibrant use of colour or defined and bold brush strokes, there is no mistaking a Peter Max. The visual weight of the elements within the artwork form the principle of balance. A well balanced artwork moves the viewer’s eye around the artwork easily, whereas a painting without balance is more difficult to navigate with the eye. Achieving balance can be done in multiple ways, symmetry in which both sides of the composition have the same features in directly opposite spaces, asymmetry where the artist will use different shapes and forms to balance the work out, and radial symmetry in which elements of the art are spaced around a central point. Contrasting elements are where specific parts of the work are stronger than another part of the work. When placed next to each other contrasting elements can be used to add depth or offer shade, or to make for example a specific element stand out much more. When looking at artwork the viewer is often drawn first to the contrasting elements and often negative and positive space is used to create contrast, although complimentary colours sitting side by side are good examples of using contrast. Emphasis is really an extension of contrast and it is where the artist has created an area of the work which is visually more dominant. A line is not just a dot who went for a walk. A line is an identifiable path which is one dimensional and can vary in width, direction, and length. Lines are often used to define the edges of a form and lead the viewer’s eye around the composition. Vertical lines are often used to communicate a sense of height running perpendicular to the earth, or they could be horizontal and suggesting a feeling of rest, or a sense of space. When used in landscapes a horizontal line denoting the horizon appears to continue beyond the canvas and imply a continuation. Lines can also be curved to give the appearance of fluidity and convey energy, or in the case of horizontal and vertical lines, can be used in combination to give the appearance of stability and solidity. Diagonal lines often convey feelings of movement, perhaps falling or other instability. Rhythm is created by movement which can be created with the repetition of the various elements and lines in an organized non-uniform way. In reality space is three-dimensional but in art it can refer to a feeling of depth or be used to give the impression of a third-dimension. Space can also refer to the artist’s use of the area within the painting, and negative space can be used around the subject whilst the subject area is positive space. Colour is made up from three principles, hue, (Red, Green, and Blue etc.). Value, how light or dark an area of the artwork is, and Intensity which is the purity or strength of the colour. Depending where the colour sits in the colour spectrum some colours are described as warm such as reds and yellows, and others cool such as blues and greys. The value determines the brightness of the colour so an artist who wants to portray darkness will be using much darker tones and will use contrasting tones which are much lighter to highlight areas of light. Intensity refers to the brightness of any individual colour with undiluted bright colours which are usually used to depict an energy or they can be mixed to create a more sedated tone which for example might be used to depict a serious mood. When we touch an object we know what the texture feels like but on a painting artists will often recreate the illusion of a texture. On a two-dimensional artwork the artist will use shadows, variances of colour, and lines to portray a specific texture. Silk for example will have plenty of much lighter contrasting colours which indicate that light is reflecting from the surface, whereas something like a dull stone will have much heavier and dulled colours to highlight the surface area. There are other elements too which might not be as obvious within the actual work but are key in determining the artworks significance and/or meaning. Context is the set of circumstances or facts which surround a particular event or situation and could include things such as when the work was created, how it was created, and for what purpose the work was created. There might be historical references within the artwork but historical information about the artist is also important when looking at the context within any given piece of art. Whether economic, philosophical, social, or cultural, the context with which the art was created and the complicity within that context is intrinsic to the artworks meaning. Looking at how the art relates to other art from the same period, what you know about the artist, whether or not the art relates to any social or political history of the time, who was the work created for, all will help to form the context of the piece. I truly believe that context is one of the most important aspects of any art. The context can decide where and when a particular piece is displayed and art teachings rely on historical and contextual narratives to convey the meanings with art movements and then those narratives often decide how art museums are structured. Content is the emotional or intellectual message of the artwork, its meaning, and aesthetic value, content is not just a description of the subject used within the art. 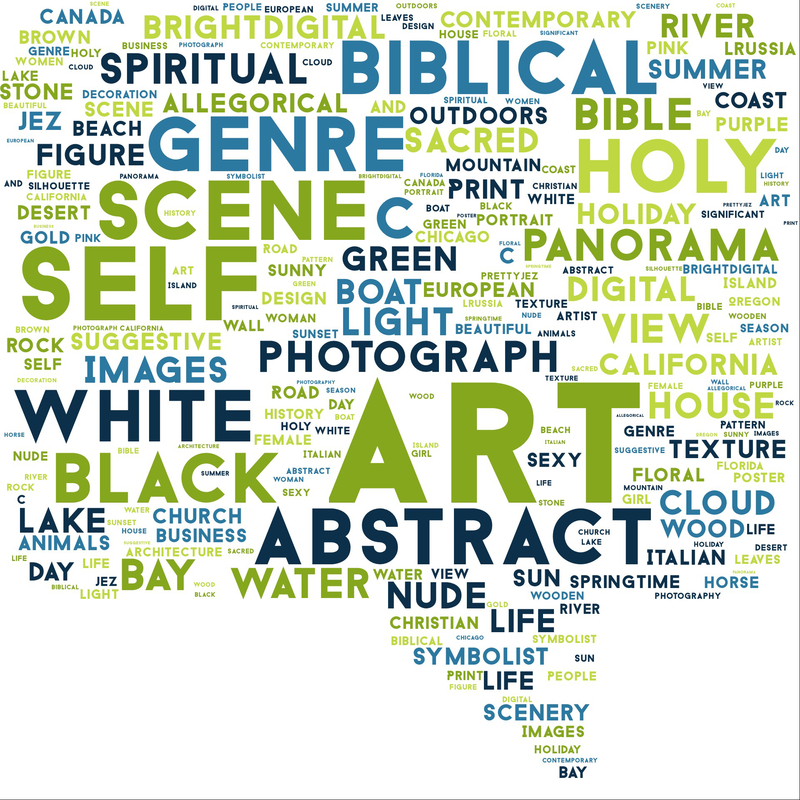 What is the art about, what genre is the art, portrait, landscape, abstract, and what the art represents. Content is more than merely the subject matter. Just as important is the title of the work which can give the piece a completely different meaning and which can provide a message as to what the work is portraying. These are the words I came up with when my daughter had to start critiquing other artists work as part of her exam preparation, and as she received good grades they seem to be as good as any! I have broken words into sections such as elements of the artwork, adjectives, nouns, verbs, and of course genres which you might want to use. Having an understanding of what each means will give you a head start. Never use a big word when a singularly unloquacious and diminutive linguistic expression will satisfactorily accomplish the contemporary necessity. Sounds like many of the artists’ statements I have either prepared or read within a gallery doesn’t it? In short, why use one word when a dozen will do. This does seem to be a ‘thing’ in the art industry, we all seem to love using words, but actually there is a good reason for doing this. Describing artwork isn’t quite that easy sometimes. Here’s something you can try out though. Grab a willing partner and ask them to describe a piece of art of their choosing whilst you draw it. Two thirds of the time you can bet that what is being described bears no relation to what you have drawn. But, if the art is described more specifically using terminology which exactly describes the nuances of the art, the results are going to be much closer to the original artwork the describer picked. In order to describe your own art, critique the work of others, and to be able to more usefully talk about art and write those descriptions, being able to call on a specific vocabulary of words will help you enormously. I literally keep lists of words and phrases for the times when I stumble across a creative block as a writer and artist. I do this because sometimes I know what I want to express, I just can’t quite put my tongue on the actual word. Keeping these lists has helped me create better descriptions for my art, and it has also helped when it comes to critiquing art from other artists. 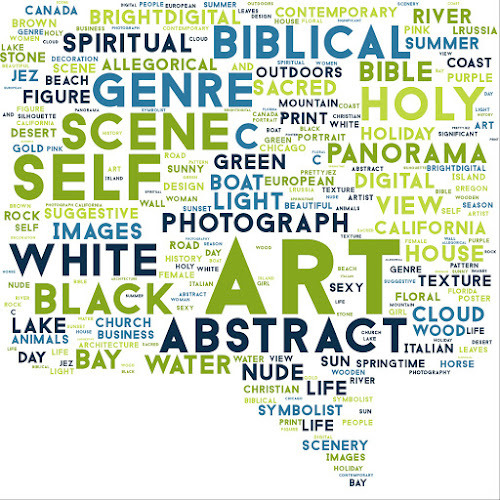 Many of the words have come from reading many artist descriptions over the years, others have come from words that spring to mind when viewing certain pieces of art. Quite a list isn’t it! Those are words which can be used within descriptions and statements, and for critiquing artworks, but there are also some more general words we can use which cover various artistic styles. The following list cover many of the artistic styles and movements and I am sure that there are some which I haven’t remembered to include! So if I have missed your particular artistic style off the list, forgive me, it is currently 3:18am on a Sunday morning as I write this. I also know that some people will suggest that digital art or other art forms are not true art, I beg to differ and remember that art is subjective. If a visual form, picture, photograph, or representation evokes an emotional response at the point of being seen, surely it is art? I am a digital artist who for 30-years has had this debate yet I still sell my work, in fact I sell more digital work than I do my acrylics, oils, and watercolours combined. Often you will need a vocabulary which also provides some context to your descriptions, so now we will cover a few ideas that you might want to refer to when writing statements or critiquing art. I was going to split up the adjectives from the nouns and verbs, but for brevity I decided not to. I apologise but I am conscious that by the time I finish this post it will be time to write next week’s post! If someone wants to pull a list together with the words separated out, feel free! The lists outlined above will hopefully give your creative word block a little nudge so that you can at least add words used within the arts to create your statement or indeed to critique art, but do use them wisely. Understanding them is one of the most useful foundations you can have to start understanding the wider world of the arts. I purposely offer no explanations for each word, although I will expand those tables in time and will offer an explanation for each but conscious of publishing deadlines, so consider this as a work in progress and in the interim just copy the word over to Google which will for now act as a dictionary! I say use the words wisely and as I mentioned earlier, it’s important not to make your statements overly technical. Art buyers are human and here’s a little secret, ‘humans like to communicate with other humans on a human level’. The example I gave towards the beginning of this article was actually generated using an online tool to create random sentences which I then strung together. No wonder it really made no sense, but this is exactly what artists and gallerists have been doing since someone invented the artist statement. In short, those words don’t come across as being human at all and they set a foundation for the statement to become far too technical. Think of the artist statement as being just as important as the art itself. Nowadays our art galleries are open 24-hours a day, 365-days each year. So it is ridiculous to think that every artist could meet every person who views his or her work. Instead, your statement becomes a virtual you and it will sell your work when you are not present. Now that gives the statement a little more importance doesn’t it? In short this is when the artist needs to become an online marketer. I have written about marketing many times previously here on this blog and a quick look through the archives will provide you with some hints and tips I have picked up over the years. No one is born an internet marketer, and just as with art, the more of it you do, the better you will become. Another consideration within the artist statement is that you need to find a very fine balance between providing the required detail and giving it the creative touch that will convince people to buy your work. You definitely want to avoid being pushy, but by the time the statement has been read by the viewer, you want them to be convinced that they want to own the work. Only if you know everything about your demographic should you really play about with the formula and make it more technical. I know that many of my collectors like me to explain in detail the process of creating the art, but others who buy my art, buy it because it resonates with them, or it is a piece they particularly like and have no desire to fully know what the process was in creating it. The goal ultimately is to provide a mechanism which bonds the viewer and the artist and appearing aloof particularly in the world of online art sales is best avoided. You need to connect. · Earlier I mentioned the length of the artist statement and I have found the best ones generally run at around 150-200 words and if you are not too sure how to even start, my best advice is to just write anything you can. Once you have started writing it becomes much easier as you progress and once you have finished writing you can then re-read it and make the edits or start over. · Many people might only spend 15-20 seconds in front of a painting and if they are disrupted by having to read a lengthy description it will become disruptive to their flow. · Write more than one statement for each artwork and then decide which one you should use. Get friends, family or anyone else to help you with this. Not only will you know it makes sense, but a second pair of eyes will help to eliminate any grammar or spelling mistakes. · If you are writing a statement for a gallery, presentation is key. Many galleries and sales platforms are now online and this is now the most popular way to submit an artist’s statement. · Some platforms offer little in the way of controlling how your statement is displayed, many of them will use a word count and a generic font, and this is how it gets displayed. · Others though might want a printed artist statement and this is your opportunity to excel in terms of presentation. First off, make sure that the medium your artist statement appears on is clean. There’s nothing more off-putting than reading a coffee stained sheet of A4 sized paper. · You don’t need any special paper in particular, but I prefer to print my own statements using a heavier paper usually off white or cream. I avoid brightly coloured papers altogether because they can distract the viewer all too easily, and avoid using anything that remotely looks like clip art. The gallery owner is not attending your five-year old’s birthday party. · I have seen some of the most beautiful art and next to it a statement typed in the Comic Sans font. No matter how cool you think this looks, it’s not. It was for maybe a day back in 1994 when it first offended so many of us typographic nerds. · Make sure that the font you use is clear and that you are able to read it easily. You need the message to be conveyed as easily as possible, so consider using the basic fonts such as Arial and Times New Roman. · When it comes to getting a message across, less is more. Keeping a simple and elegant design is a much better option than creating something with added flair. · Think about what you want to write in your statement before you commit to writing anything. I tend to scribble down ideas but occasionally I will write down the subject of the art and come up with things that originate from that subject using a mind map. · Rather than fill the statement with every word in the tables in this article consider using a few periodically. If your work was inspired by the great Masters such as Matisse, never say that Matisse was a significant reference and inspiration in my research based practice before commencing this new body of work. No, just say that the work was inspired and influenced by Matisse. · Write down how you would describe the work if you were standing in front of the viewer. Would you really say that ‘this is an outstanding work produced by the artist’ or would you say, I am very proud of this work? · Refine your first attempt, and your second, and your third, then you might be somewhere close to having an artist statement that will resonate with the reader. · Create different statements for different purposes – you will want to add more detail in statements written for arts grants, less detail for others. Hopefully you will now have at least a few more words you can throw into the mix to write an artist’s statement, and you should now be looking at yours and others works a little differently too. A better understanding of how art is structured helps when it comes to writing the statement, and considering the who, what, where, and when, will help you to present your work to a much wider audience. If you have any tips that I haven’t covered today, please do leave a comment and let us all know! Mark A. Taylor is a UK based artist who sells his work around the world online here, http://10-mark-taylor.pixels.com and in more than 150 retail stores across the USA and Canada including The Great Frame Up, Framing and Art Centre, and Deck the Walls.